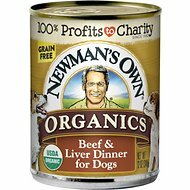 Newman's Own Grain-Free Premium Lamb Liver & Vegetable Stew Canned Dog Food is a mouthwatering stew with only a handful of natural ingredients plus vitamins and minerals. Grass-fed lamb and beef liver are simmered in a rich, meaty broth and combined with fiber-rich carrots and pumpkin in a hearty stew. Fish oil supplies omega-3 fatty acids to keep your dog’s coat lustrous and support healthy skin and joints. Newman's Own are fine dining meals that are grain-free with no artificial colors, flavors or preservatives. 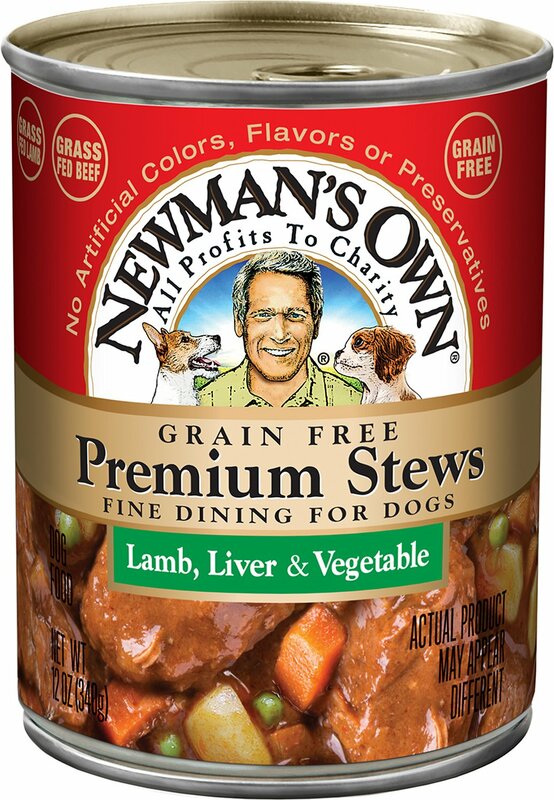 Premium, hearty stew recipe is like fine dining for dogs with complete and balanced nutrition. Lamb is the number one ingredient, simmered in a rich beef broth with beef liver, fiber-rich carrots, and pumpkin. Includes fish oil as a source of fatty acids to support healthy joints, skin, and a shiny coat. Grain-free all-natural recipe is highly digestible with no artificial colors, flavors, or preservatives. Made in the USA with a unique blend of proteins, whole grains, vitamins, and minerals. Lamb, Beef Broth, Beef Liver, Carrots, Potatoes, Pumpkin, Peas, Fish Oil, Minerals (Calcium Carbonate, Potassium Chloride, Ferrous Sulfate, Zinc Proteinate, Zinc Oxide, Manganese Proteinate, Copper Proteinate, Calcium Iodate, Sodium Selenite, Manganous Oxide, Sodium Phosphate), Vitamins (Vitamin E Supplement, Niacin, Pantothenic Acid, Thiamine Hydrochloride, Riboflavin Supplement, Vitamin A Supplement, Pyridoxine Hydrochloride, Vitamin B12 Supplement, Folic Acid, Biotin, Vitamin D3 Supplement). Adult: Feed 1.5 cans per 20 lbs of body weight daily. Puppies, Gestation or Lactation: Feed 2 - 3 times the normal Adult amount. Feed according to the age, size and activity of your dog. I have tried 6 different brands, all of which were highly rated by testing labs. This is the only brand my 90 pound buddy will consistently devour. People complain about how it looks but it is real whole pieces of meat and vegetables... not mashed up parts that are formed back into cubes. There are pieces of solid fat in the can which comes from the cooking and cooling process. If you don't want that fat for your dog it is easy to pull those solid pieces out of the dish.. Its real food!! The food looked disgusting with coagulated fat in it. Though my dogs did like this, I won't be getting it again. I guess when your picky cats start scarfing it down on the counter top before you give the bowl to your dog, that is a good thing. Your fur baby will gobble this up. 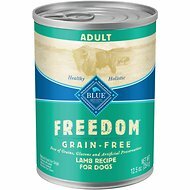 My dogs love this food. I am happy to have found it as it is so close to homemade you Can't go wrong. All Fat! Horrible looking meat. I don't think this is Organic either even though it is Newman's Own Organics. Excellent product, my dogs love it, will buy again, in the future. This is one of the best we have tried - reasonably priced, filled with a nice blend of meat and veggies, perfect texture with the right amount of gravy, and very well received by our dogs. The pea sized meat was in a can of water/thin broth. We had to strain it! It was disgusting and looked nothing like the picture. Highly disappointed.